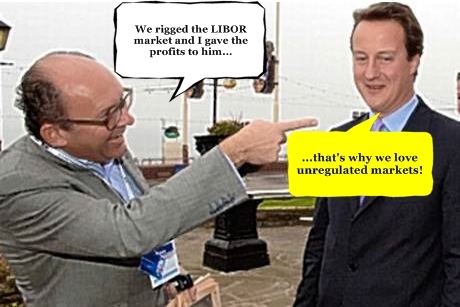 On Wednesday it was revealed that former Tory treasurer Michael Spencer‘s financial broking company, ICAP, had been fined £55m for fixing the LIBOR market. Spencer, who owns 17% of the company valued at £2.41bn has donated almost £5m to the Conservative party in recent years. When questioned the Conservatives have said that they have no intention of repaying the money or gifting it to charity as Labour have suggested. So far, so politics as usual. In an interview with The Telegraph, Mr Mills said that the donation was made in shares rather than cash so the tax on the deal would be significantly reduced. Describing the donation as “tax efficient”, he said the form of the donation was agreed with figures in Labour’s fund-raising team…. The news will embarrass Ed Miliband, the Labour leader, who has repeatedly criticised tax avoidance. He said only last month that it was “wrong” that Google had gone “to extraordinary lengths to avoid paying its taxes”…. There certainly is “rank hypocrisy” going on here but it’s not just from the Labour party. Take a quick look at look at some of what the Tory’s have been up to in the video above and then judge for yourself whether it’s only the Labour party that’s guilty of hypocrisy. Both parties argue that state funding of political parties would be unpopular with the electorate and they are almost certainly correct – but would it really be less popular than the corrupt system that we have today. Big money buys influence and government policy. It is in the interest of our country’s democracy that we have a government that makes policy based on evidence about what will produce the best outcome for the nation as a whole. That is why we MUST demand state funding for political parties and the removal of the influence of vested interests on the right and the left of the political divide.